PASAY--He's back as a world champion! Joshua Pacio is once again the One strawweight champion after getting back at erstwhile holder Yosuke Saruta in their rematch at One: Roots of Honor at the Mall of Asia Arena on Friday night. A more prepared Pacio brought the full-house crowd into frenzy when he scored a fourth round knockout against his Japanese opponent to reclaim the belt he lost to the same guy. However, Pacio had to deal with a late Round 1 knockdown as Saruta connected on a right punch that brought him down. But he slowly recovered with his crisp strikes in the next two periods, eventually forcing a swelling on Saruta's right eye area. Pacio then delivered the knockout blow 2:43 into Round 4, connecting on a high knee that sent Saruta down for good, forcing Referee Kemp Cheng to stop the fight. Pacio is now a two-time champion at One, joining Eduard Folayang, his teammate at Team Lakay, as the only Filipinos to do so. In the main event, Martin Nguyen stays as the One featherweight champion after knocking out Narantungalag Jadambaa. 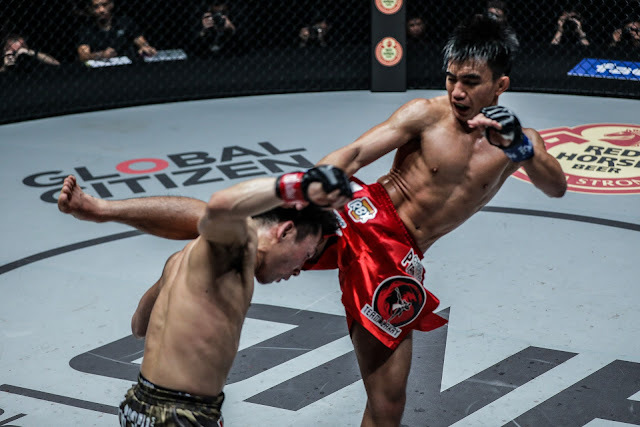 Nguyen connected on a sweeping kick that injured Jadambaa's leg, opening up a flying knee that forced the knockout at the 1:07 mark of Round 2. On the other hand, Tatsumitsu Wada held off replacement fighter Gustavo Balart to move on to the semifinals of the One Flyweight Grand Prix. Wada held off Balart's gallant stand to set up a date with Demetrious Johnson in the next round.